Researchers at Purdue University have used the emerging technique of single-particle electron cryomicroscopy to get images of a virus in twice the detail than had previously been possible. This imaging technique, called cryo-EM, has the additional advantage of being able to keep the sample being observed in a state similar to its natural environment, according the study, published in the journal Nature. Comparable imaging techniques, such as X-ray crystallography, call for the sample to be manipulated and rotated. “This is one of the first projects to refine the technique to the point of near atomic-level resolution,” said Wen Jiang, lead researcher. “This breaks a threshold and allows us to now see a whole new level of detail in the structure. This is the highest resolution ever achieved for a living organism of this size.” Details of the structure of a virus provide valuable information for development of disease treatments. In electron microscopy, a beam of electrons takes the place of the light beam used in a conventional microscope. The use of electrons instead of light allows the microscope to “see” in much greater detail. Researchers using cryo-EM had obtained images at a resolution of 6-9 angstroms but could not differentiate between smaller elements of the structure spaced only 4.5 angstroms apart. “There are different elements that make up the protein building blocks of the virus,” Jiang said. “It is like examining a striped blanket. From a distance, the stripes blur together and the blanket appears to be one solid color. As you get closer you can see the different stripes, and if you use a magnifying glass you can see the strands of string that make up the material. The resolution needs to be smaller than the distance between the strands of thread in order to see two separate strands. 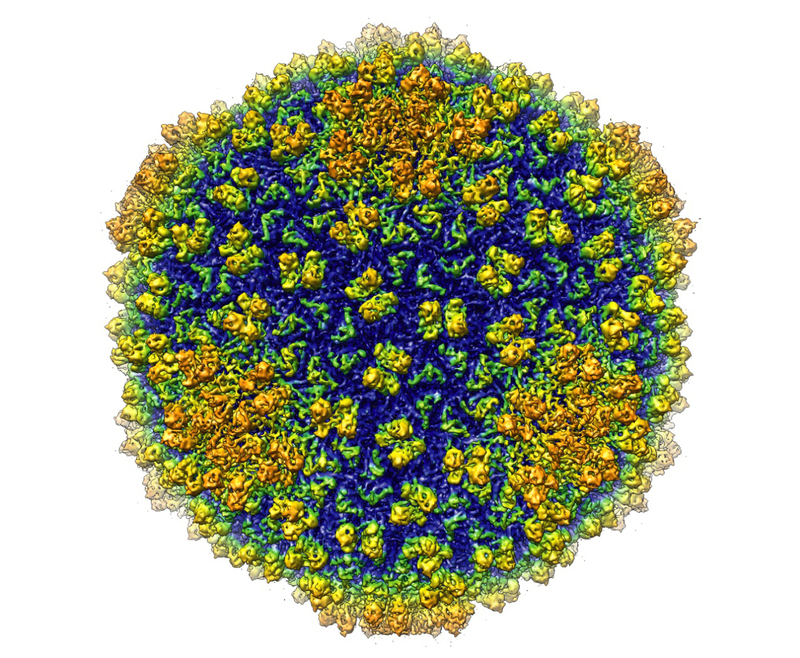 Computer programs are used to extract the signal from the microscope and to combine thousands of two-dimensional images into an accurate three-dimensional image that maps the structure of the virus. This requires use of a large data set and could not have been done without the resources of Purdue’s Office of Information Technology, or ItaP, Jiang said. Jiang used Purdue’s Condor program – which links computers including desktop machines and large, powerful research computers – to create the largest distributed computing network at a university. Jiang plans to continue to refine every step of the process to improve the capabilities of the technique and to examine more medically relevant virus species. 2. Ravelli RB, Garman EF (2006). “Radiation damage in macromolecular cryocrystallography”. Curr. Opin. Struct. Biol. 16 (5): 624-9. PMID 16938450. Next Post: What Is Positron Emission Tomography?